This is a continuation of my last post. In this post I highlight 3/6 of the ad agencies that I’m visiting this Spring Break: Leverage Agency, OMD, and Firstborn. Need a product showcased in a natural way on television? Want to make a sports sponsorship? Leverage is the place to go. They specialize in sports, entertainment and media marketing . They are all about product integration-making a product part of the show-and finding property (teams) that can fit a brand’s campaign. The Leverage Agency was founded in 2005 in a NYC apartment. The Leverage team has since moved three times, progressively into bigger offices. The firm has now sold more than $100 million in sponsorships and has offices in 3 other cities throughout the world. In 2010, the Sports Business Journal recognized the Leverage Agency as a top 5 agency in sales, property, consulting, and client services. If you watch Jimmy Kimmel Live! you frequently see Leverage at work. They have sold branded integration for everything from KFC to Dyson Fans. The beauty of this work is that it often does not seem like advertising or marketing, as the products usually appear in the form of a skit. Of particular interest to me is Leverage’s founder, Ben Sturner. Sturner is a Boston University College of Communication graduate. He started at Lycos, where he worked on endorsement deals with John Elway and Mark McGwire for an integrated national advertising and promotional campaign. I can’t wait to hear and trace Sturner’s story from his time at BU to the CEO of a major marketing company. It will really put my own journey into perspective. In the news: Sturner recently returned to BU to discuss sports marketing. In January, the Ivy League Office announced a partnership with Leverage. Some clients: EA Sports, Top Rank Boxing, The Basketball Hall of Fame, Reddit, Anheaser-Busch. Campaign highlight: Leverage recently took up the mammoth task of PR for H+M’s SuperBowl ad featuring David Beckham. They were directly responsible for an overall 1.2 billion media impressions. The OMD network, a part of the Omnicom Group, is the result of the unification of BBDO, DDB, and TBWA media operations. They are the the media planning and buying wing of Omnicom. They have several divisions that specialize in different areas of planning. Optimum Sports, for example, manages branded content. At first it’s really tough to decipher the specifics of what is going on in the OMD network, only because it is so large. In fact, OMD North America is the largest media network in North America. It’s highly effective, earning more media lions last year than any other network. OMD North America also won Advertising Age’s 2011 media agency of the year. Under CEO Page Thompson, OMD North America has added $8 billion in business since 2005. I’m looking forward to seeing what goes on behind all these awards. With mobile being such a hot, fast-moving topic, I really want to hear about Airwave, the segment of OMD that handles integrating mobile into campaigns. I’d also like to hear some examples of OMD’s Social media solutions. How do they handle something that basically requires a 24/7 response? In the news: Big surprise, OMD is highly competitive. Some clients: Nissan, the CW, Frito Lay’s, Intel, GE. How do you sell your car to millennial? Put it in a video game, of course. Give us a chance to interact with the car. Better yet, give us a chance to compete to become a real race car driver. The result? A 31% increase in engagement with the Nissan brand, of course. My trip to New York City wouldn’t be complete without a visit to a well-known digital agency. Who better than Firstborn, the UX masters? This agency, which has been around since 1997, has been highly successful and has still remained independent. Several agencies rely on the digital expertise of Firstborn. For example, Goodby, Silverstein & Partners and Fallon have used them in the past. They create digital applications-anything from product launch websites to CRM tools. I’m trying to (find the time to) learn the basics of how to code. I wonder what level of expertise in coding it helps to have if you aren’t a designer, but a copywriter or a strategist. Some clients: Redken, Sobe, Fidelity, Sony, Wrigley. In the news: Eugene Chung, director of strategy, was named in Forbes 30 under 30. The UNIQLO Dry Mesh project, a Pinterest experiment was also featured in the same publication as one of the most unforgettable ad campaigns of 2012. 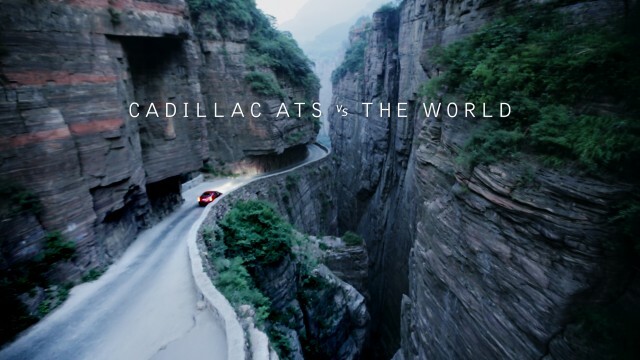 Campaign highlight: Cadillac ATS Vs The World is certainly up there with Bear 71 as one of my favorite interactive experiences from last year. Fallon’s trip around the world is mesmerizing on its own,but Firstborn really made the experience shine. I’ve seen a several uses of parallax scrolling in sites, but few as successful as this one.